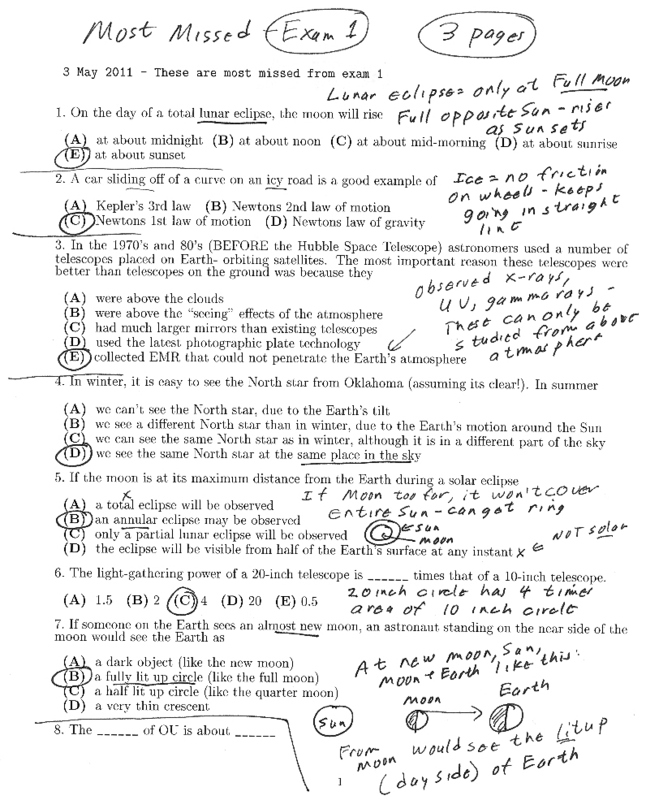 Example - "Most missed" questions from exams 1,2,3 I have put the most missed questions from the midterms on the web site (this is just an example page- see "Stuff for Final" link for the rest.) I will be looking at these while I write up the final exam. I will cover the same ideas and concepts as these questions cover, but the questions on the final will not be identical. SO, you should make sure you understand the idea of each question and not just memorize it. Today I will talk about AGNs- active galactic nuclei. "Normal" galaxies radiate light and other EMR from gas clouds, stars and their remnants. However, some galaxies clearly have "something else" going on, as they emit large amounts of power from their very centers (or nucleus). These galaxies are called "active nucleus galaxies". Over the last few decades, astronomers have learned that the AGN phenonomon is related to the presence of supermassive black holes in the centers of at least some galaxies. Optical (top) and radio (bottom) view of radio galaxy Soon after World War II, radio astronomy really took off, using technology that had been developed for radar during the war. One of the first things astronomers discovered was a class of galaxies that emitted a lot of radio energy. These galaxies were called, believe it or not, "radio galaxies" (sometimes astronomers come up with clever names for things, and sometimes- like here- they don't). Over the years radio telescopes improved and astronomers found that the radio energy frequently came, not from the visible stars in the galaxy, but from two radio lobes on either side of the galaxy. 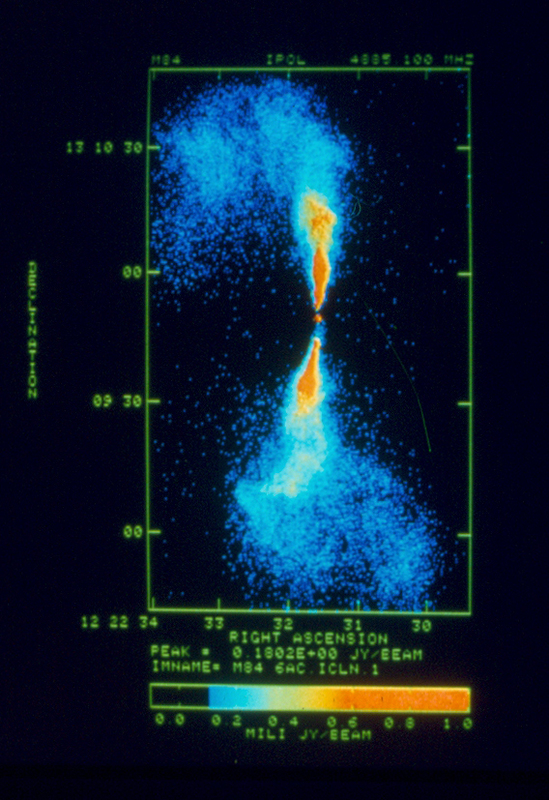 This shows a typical radio galaxy. The top is just a (not very good) visible light image of a galaxy. The bottom shows an image of the radio emission from the same patch of sky as the top image. Pseudo color view of radio galaxy Another radio image of a radio galaxy. Here the colors indicate intensity of radio wave emission. One gets a definite impression of stuff squirting out in two opposite directions from a central point. 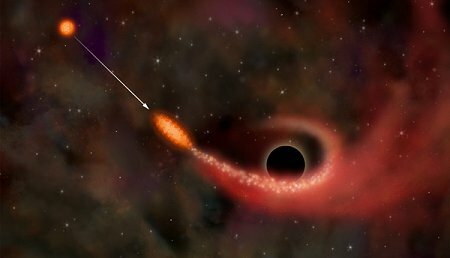 We now think that the "central engine" that powers the radio galaxy radio emission is a supermassive black hole and accretion disk (see below). 3C273- One of the first Quasars This looks like a picture of a boring patch of sky- almost all the black dots (this is a negative image, of course) are stars in our own Milky Way. 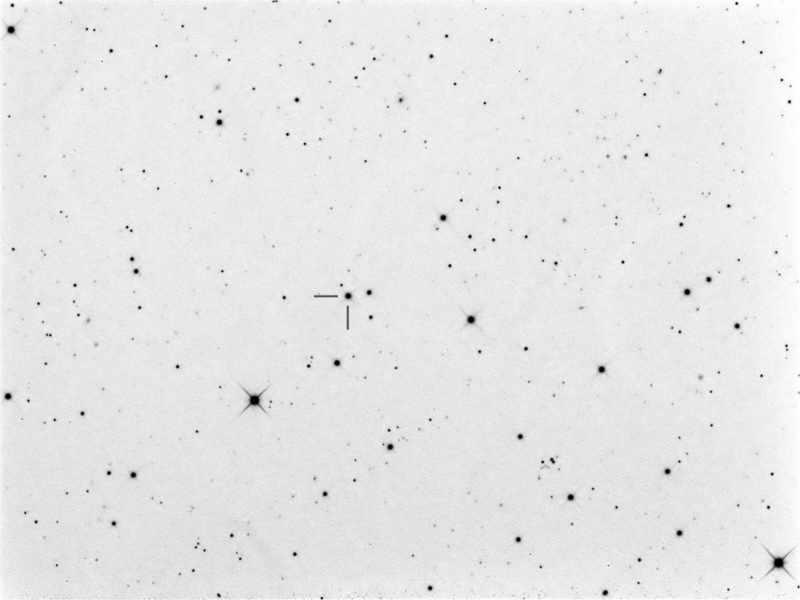 (The crosses surrounding the brighter stars are an artifact of the telescope and are not really part of the stars.) However, the "star" marked by the two lines turns out to be Something Completely Different (for you old Monty Python fans). This object looks like a star, but has an very large Doppler shift. Assuming the Doppler shift comes from the expansion of the universe ( Hubble Law) this object is enormously far away. The fact that it can be seen as bright as it is means that the object must be more powerful than 100 or so normal large galaxies! Such objects were first called "quasi-stellar objects" but the name soon became shortened to "quasar" (now quasar is a much cooler name than radio galaxy, don't you think?). 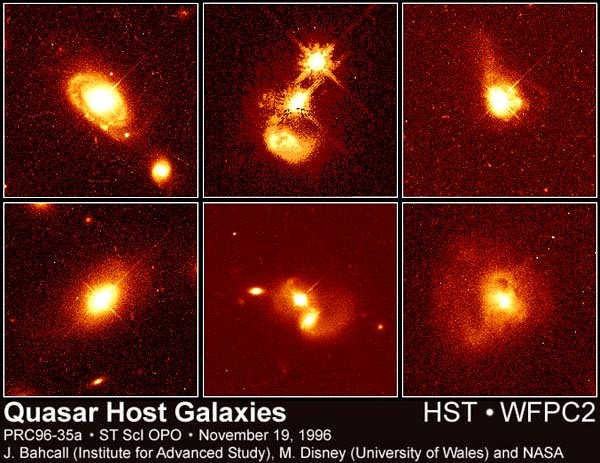 Quasars from HST These are some images of galaxies whose centers are quasars. These quasars don't look like much- just a bright point of light in the centers of some galaxies. The excitement of quasars comes from understanding that these tiny (tiny relative to a galaxy) objects can be more powerful than trillions of stars! 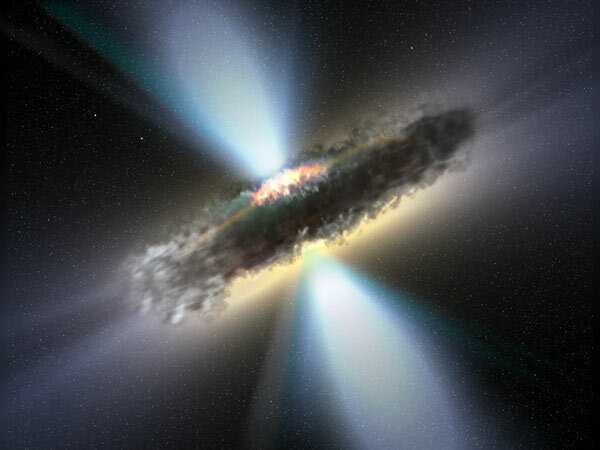 We think the quasars are powered by matter (gas and stars) falling into supermassive black holes. Size of rapidly varying object Because of the finite speed of light, large objects cannot vary too quickly, as it takes time for the light to travel across the object. To illustrate this point, consider a bunch of light bulbs over a region of space 1 light-day across. 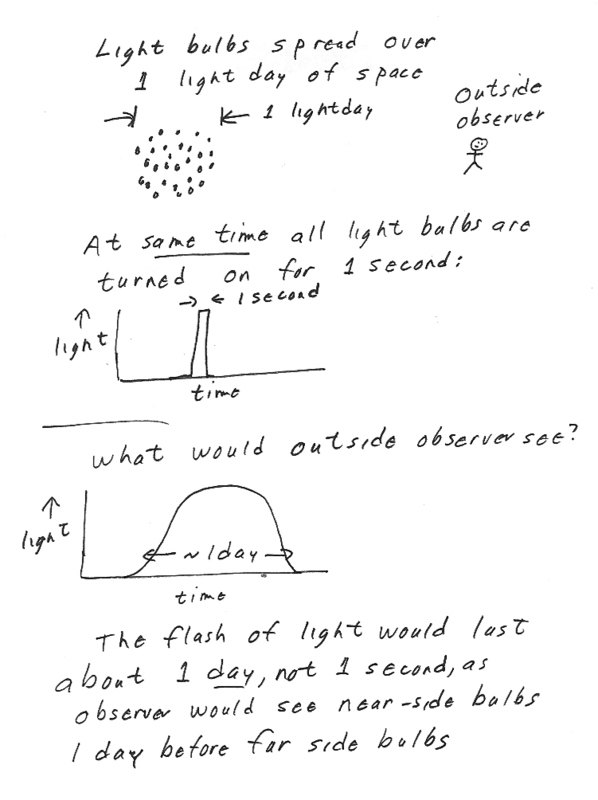 If all the light bulbs flashed on for one second at the some time, an outside observer would see a flash of light that would last about 1 day, not 1 second, as she would see different light bulbs at different times because they are at different distances. The fact that some quasars are seen to vary significantly in short time periods means that the region generating the power must be small. For example, a quasar that varies significantly from week to week must be less than 1 light-week in size. A typical large galaxy is 10s of thousands of light YEARS in size, so a light week is very small in comparison. The only source of power that we can imagine that can be so small yet so powerful, is a supermassive black hole. A naked singularity? A black hole has a definite size - it is a region of space from which even light cannot escape. The more mass inside the black hole, the larger the black hole. 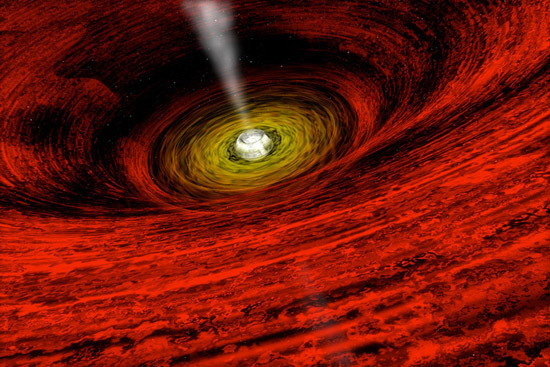 What is inside a black hole? We will never know for sure- we cannot ever see what is going on inside a black hole because information cannot escape from inside the event horizon which marks the boundary of the black hole. As far as we know, the actual shrinking mass that forms a black hole will just get smaller and smaller and smaller.... Our equations break down if the mass becomes a true point (with size = 0). A full understanding of singularities must await a better theory of gravity, one that takes into account quantum mechanics. A true point of mass is called a singularity. It would have zero radius (R=0). An idea called "cosmic censorship" is that all singularities are hidden inside black holes, so we can never hope to see a singularity. 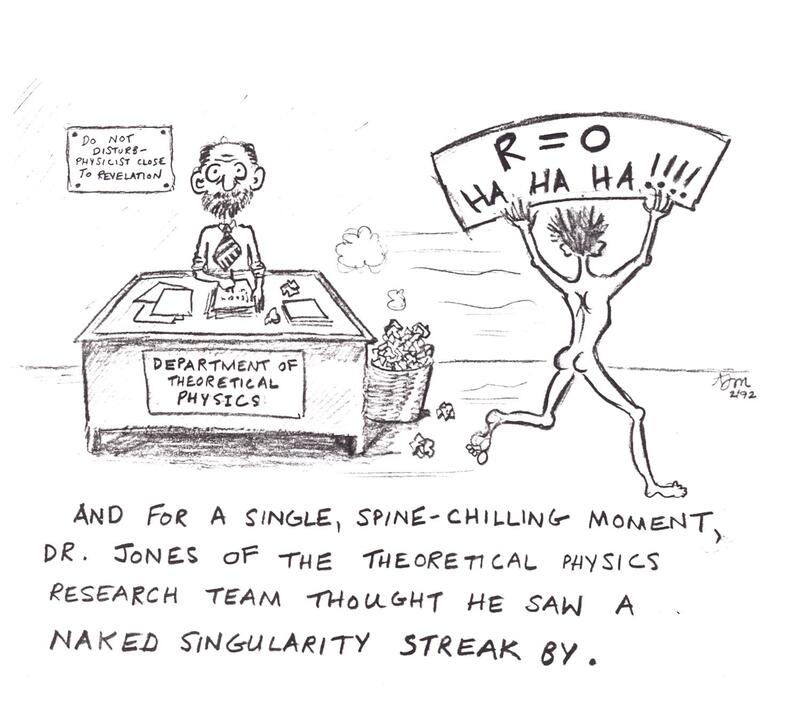 This is often expressed as "There are no naked singularities". Long ago, one of my students thought this phrase was hilarious, and she drew me this cartoon. Accretion disk around a black hole (cartoon) How can a black hole, which has a strong gravity that would pull stuff inwards, be responsible for blasting stuff away from itself in two jets (like in a radio galaxy). The key is that the black hole is surrounded by an accretion disk, which you can think of as a whirlpool through which stuff (stars and gas) falls into the black hole. Because of the spin of the stuff falling in, the infalling stuff tends to form a disk. As matter falls into the black hole, the accretion disk forces it to follow a spiral path inwards. As the matter gets nearer and nearer the black hole, the matter is heated by friction to fantastic temperatures. This hot matter emits enormous amounts of power that can account for the extreme power output of quasars. 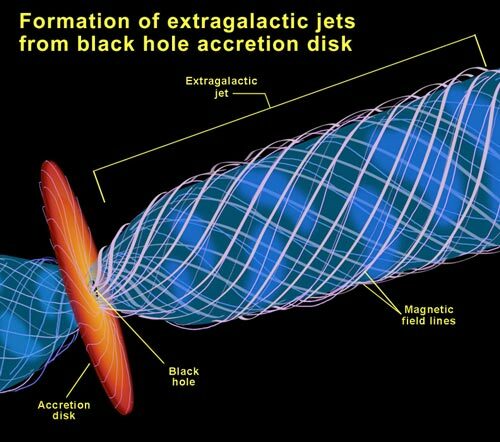 The accretion disk is Natures way of extracting some of the enormous gravitational force of the black hole and turning that gravity into radiation which we can see and detect with telescopes. (1) Black hole art (2) BH art (3) BH art (4) BH art These are some *artists conceptions* of what is going on near a supermassive black hole (SBH). We CANNOT see the details of this, as the accretion disks around black holes are too small and too far away to see any detail with any telescopes we now have. The first image shows gas swirling into a SBH. 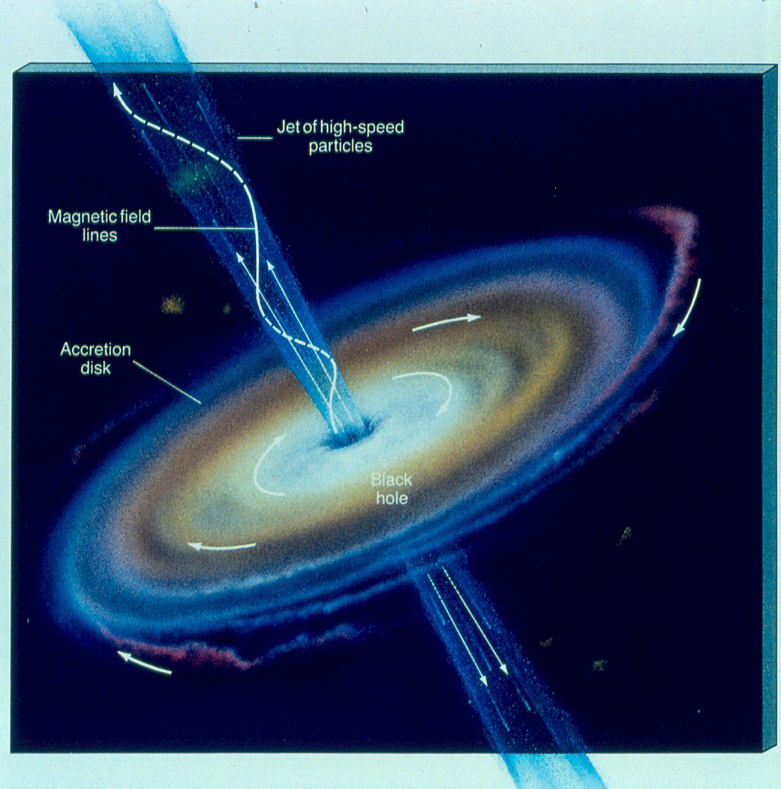 The second diagram shows a SBH, its surrounding accretion disk, and "jets" of material shooting out along twisted up magnetic field lines. The third image shows a "side view" of SBH, accretion disk, and jets. 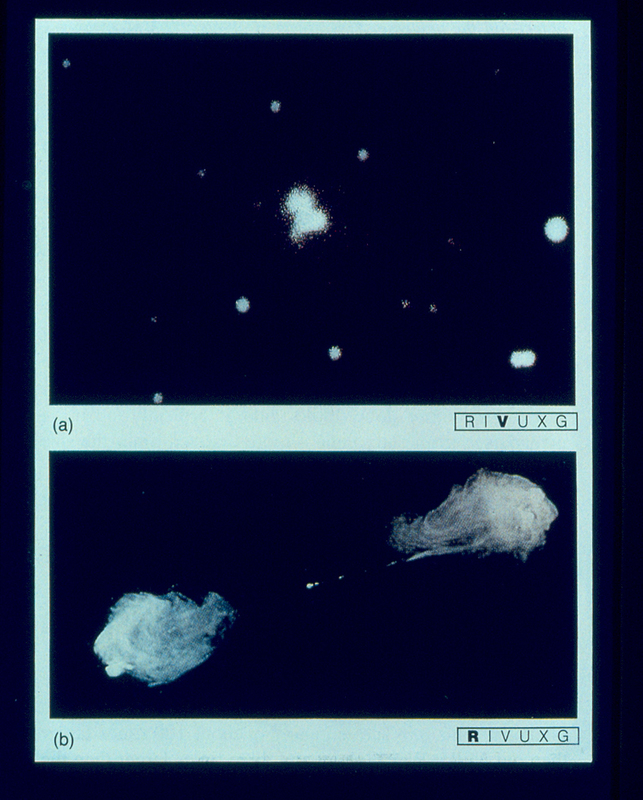 The last image shows a star being ripped apart and partially eaten by a SBH. Don't bother planning a sightseeing trip near a SBH- if you were close enough to the SBH to see these details, you would be fried by the intense radiation emitted by the accretion disk and jets! The supermassive black hole at the heart of the Milky Way The closest galaxy nucleus to us is of course the center of the Milky Way. As discussed in the DVD "Monster of the Milky Way", we now know that a supermassive black hole, about 4 million times the mass of the Sun, lurks in the center of our galaxy. The most definitive proof of this comes from an amazing study of the motions of stars very close to the center of the Milky Way. These stars had to be studied using infrared radiation, which passes through the dust between here and the galactic center. 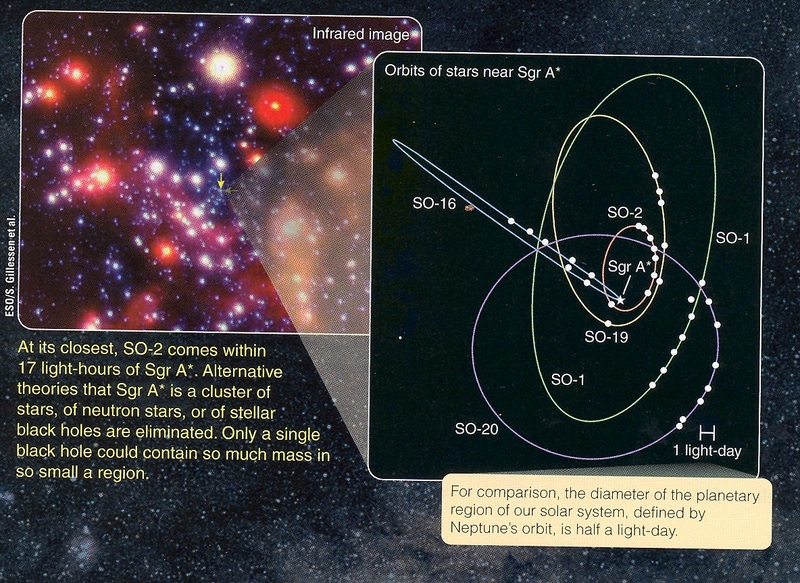 A study over 15 years shows the motions of a dozen or so stars. From the speed of the stars, and the distance they travel, we know that there is a large mass (4 million solar masses) in a very small volume of space. The only thing this mass can be is a supermassive black hole. For a movie of the motions of the central stars, click here. The last 20 seconds of the movie show the motions of some stars near the center of the galaxy (Sgr A*). This is speeded up, of course, the actual star motions cover about 15 years.